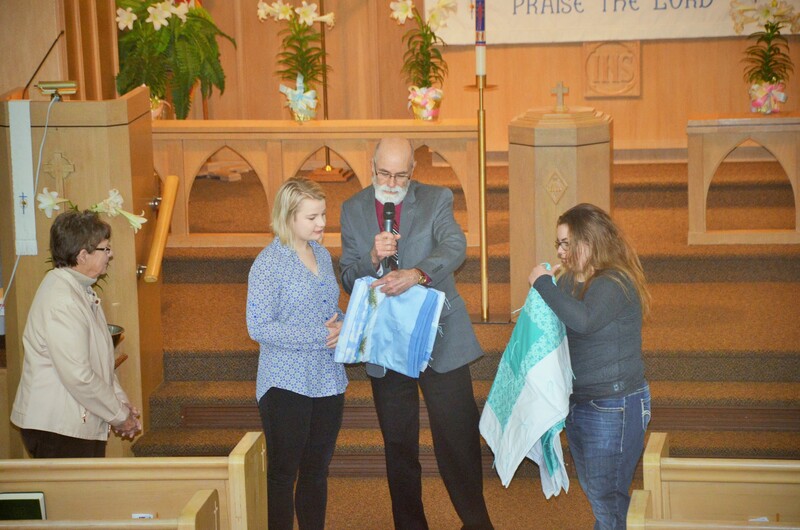 At the beginning of the Sunday, April 30, 2017 worship service, Martin Luther Church presented two graduating high school seniors with blankets to take with them in their future endeavors. The blankets were made by the Sewing Group and were chosen by each of the graduates to remind them of their caring church family. Brandie Brown will be a graduate of Johnson Brock High School. She will be attending Norfolk Community College to become a veterinary technician. Alyssa Rippe will be a graduate of Syracuse-Dunbar-Avoca High School. She will be attending Creighton University in the pediatric medical field. Ramona Boone, a member of the Sewing Group, presented the blankets. Pastor Ken then visited with Alyssa and Brandee so they could share with the congregation their future plans. Ramona Boone, Alyssa Rippe, Pastor Ken, and Brandee Brown at the blanket presentation. After the worship service, coffee and cookies were served at a reception where members could congratulate the young ladies on their accomplishments! MLC asks for God’s blessings on Brandee and Alyssa as they continue in their life journeys!